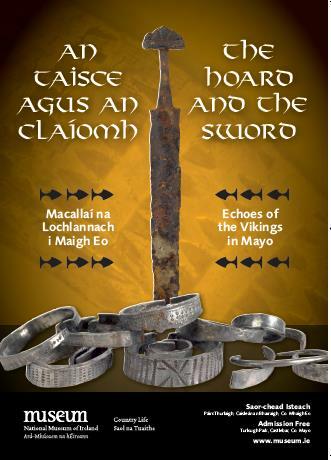 This new exhibition explores the discovery of a hoard of silver bracelets from Cushalogurt, Kilmeena, and a Viking sword found in the River Moy at Coolcronaun. This is the largest hoard of silver arm-rings found in Ireland. Find out about their discovery, their use as jewellery and currency and who might have buried them. The Viking sword, although corroded from over a millennium in the Moy, is a fine example of late 10th century craftsmanship and its conservation is revealing more details of its past. These objects give evidence of Mayo's Viking Heritage and are on display in the National Museum of Ireland - Country Life, Turlough until June 2017.